Pursuing Illustration as a Career and Passion: Many young artists want to make a living from their work but aren’t sure how to begin. 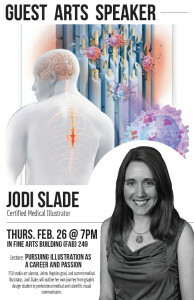 If you are an aspiring artist unfamiliar with illustration as a career choice, then come see Jodi Slade, FSU studio art alumna, Johns Hopkins grad, and current medical illustrator explore the many different avenues to begin, maintain, and advance a happy career as a professional person-who-draws-things. Jodi graduated from FSU in 2008 with two degrees: one in Studio Art and another in Biology. She then attended the Johns Hopkins Medical School in Baltimore and completed her masters in Medical & Biological Illustration. After graduating in 2011, she came back to Florida State and became the medical illustrator and animator for the College of Medicine.